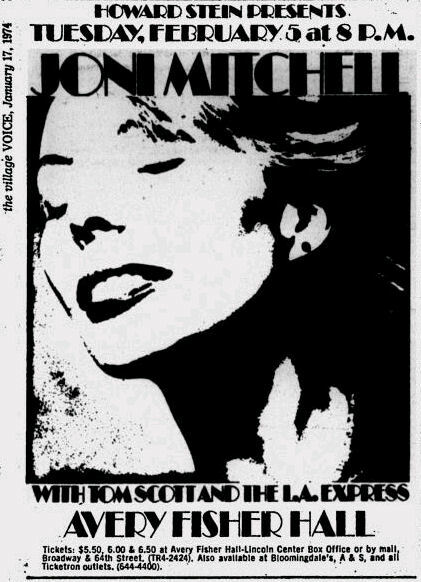 jONI WAS AMAZING THAT NIGHT.i ESPECIALLY LOVED HER PIANO WORK ON THE RENDITIONS OF THE BLUE ALBUM. 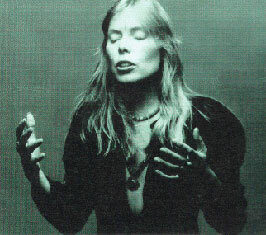 I was a senior at the University of Pennsylvania and listened to Joni all the time. My boyfriend Tom waited in line for hours at the Lincoln Center Box Office, and managed to get 3 tickets. When he called and told me he had them, I was ecstatic. My friend Renee and I dressed up in our coolest clothes and took the train up to New York from Philly. We met Tom at Lincoln Center and had supper at O'Neal's Balloon. The concert was amazing. A packed house, of course. Joni wore an elegant red sequined gown. We looked at her through binoculars from our balcony seats. I remember Renee whispering to me, "She is so beautiful!" Joni played and sang songs from all of her albums from "Song to a Seagull" to "Court and Spark," which was fairly new then. It was exciting to see and hear a live performance of all these beautiful songs by this amazing artist. I remember especially loving "All I Want," "People's Parties," "Cold Blue Steel and Sweet Fire," and "Cactus Tree." I was mesmerized by Joni's beauty, talent and grace. One funny memory I have is of Joni getting irritated at the photographers who kept taking flash photos of her at the beginning of the concert. After a couple of songs, she asked them to stop and said something like, "Don't you think you guys have enough pictures now? You've got to learn to hit the shutter on the beat."